A picture of the stolen gold bracelet. Officers are appealing for information following a burglary at an address in Totton. The incident happened at some time between 10.30am and 12.30pm on Sunday, 3 February when the offender/s used bricks to smash the back patio door and enter the house on Eling Lane. Once inside they searched the house and stole three high value watches and jewellery. 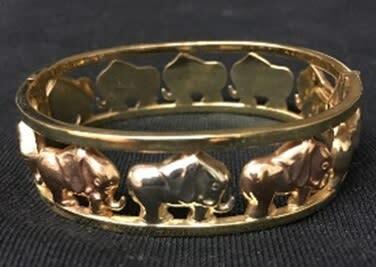 The other stolen items are described as a gold bracelet with elephants around the outside, a white gold emerald ring, a flower shaped diamond ring, a men’s thick gold chain, a Michael Kors silver necklace and a gold charm bracelet. PC Gary Kimble, said: “I am appealing for anyone who was in the area at the time of the incident, who may have seen or heard anything suspicious, to get in touch with us. “I would also like to appeal to anyone who could have been offered the stolen items for sale, or knows anyone who has recently acquired such items. The watches, particularly the Omega Seamaster, are very distinctive. If you have any information, please contact us on 101, quoting 44190041115, or call the charity Crimestoppers anonymously on 0800 555 111.